The most inexpensive pressure cooker that Fagor has available, this is also it's most basic model. If you compare its cost with that of other pressure cookers you will see for yourself that it is very cost efficient, yet a worthwhile investment, because it is designed to meet the needs of the average user. 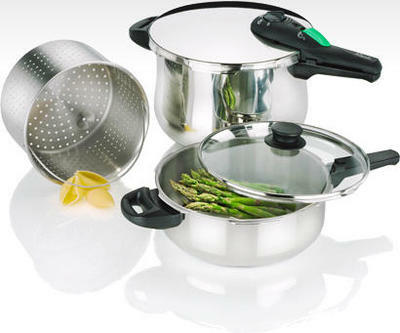 It is also a member of Rapida's specialty cookware collection. Modern appearing, it features a smooth European-designed belly shape that gives it a trim look. The Fagor Rapida pressure cooker has one pressure setting: High (15psi) and is fun and simple to use. Composed of 18/10 stainless steel and it can be successfully used on virtually every cooking surface, including: gas, electric, and ceramic. Fagor rapida is eco friendly produtc and made of partially recycled stainless steel and are polished using only mechanical procedures instead of chemical. Available in 4qt, 6qt, 10 qt and for 10 qt, besides pressure cooking, the unit can even be used for pressurized canning. An automatic pressure release system which provides an out so that pressure doesn't get the opportunity to build up inside to detrimental levels. Fagor Rapida pressure cooker also has a Triple Safety Mechanism. This includes a dual pressure control valve with a method for over pressure release, if needed, and a handle with a safety lock. In the unlikely event of an accident, you are protected from harm because the safety handle will not allow the pressure cooker to open. This is a feature that older models did not have. Now the words pressure cooker can be a bit intimidating. But you can rest assured that all Fagor Pressure Cookers are absolutely safe and carry no risk for explosion. 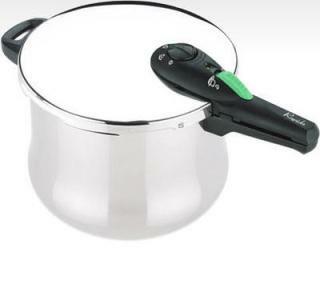 Since people who purchase Fagor cookware products are looking for convenience without surrendering quality, Fagor has given this pressure cooker a ten-year limited warranty. If something goes wrong you won't be stuck with a useless product. But there's no need to be concerned. Fagor products have an excellent track record and won't disappoint you. There is a Fagor Home Canning Kit which should be purchased along with it, however, if you are planning on using it for this purpose. As an added bonus along with it's user manual, the Fagor Rapidia pressure cooker also comes with recipe suggestions for pressure cookers. You will know when the pressure is released by looking at visual indicator whether it is raise or not. If you are looking to purchase your first pressure cooker, even if you know next to nothing about them, then this one has lots to offer and besides being visually appealing, it's remarkably simple to use.